The joy of the Gospel: After the ordination are (from left) Personal Ordinariate of Our Lady of the Southern Cross ordinary Monsignor Harry Entwistle, Fr Neville Yun, Fr Stephen Gronow and Brisbane Archbishop Mark Coleridge. THEIR journeys may have taken them on different paths, but both Fr Neville Yun and Fr Stephen Gronow have arrived at the same destination. 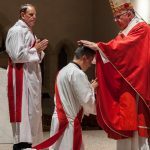 Brisbane Archbishop Mark Coleridge ordained Fr Yun a priest for Brisbane archdiocese and Fr Gronow for the Personal Ordinariate of Our Lady of the Southern Cross on Friday, November 29. 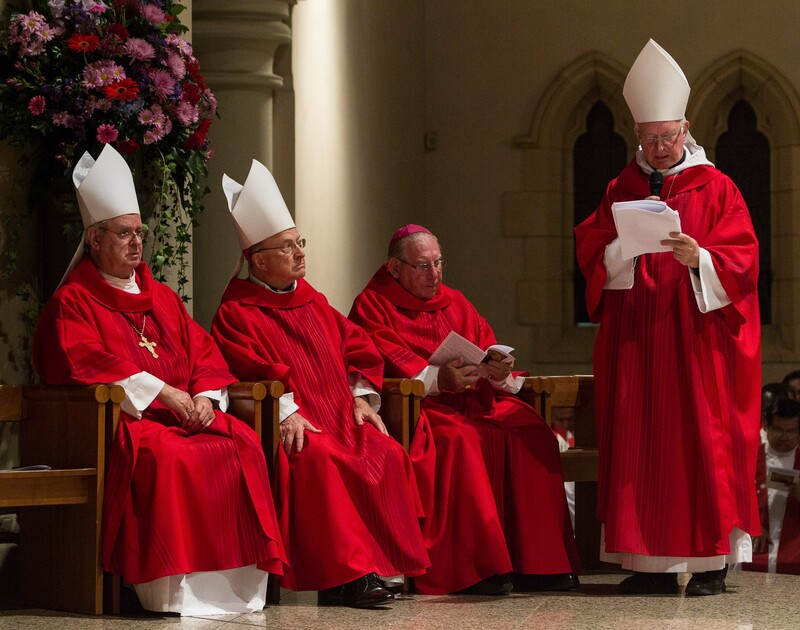 Archbishop Coleridge told the candidates the question of priestly identity was clearer in the past than today. “In the end only the word of God can answer that question for us which is why we turn to the scriptures now and to the successor of Peter as the trustworthy interpreter of the scripture,” he said. 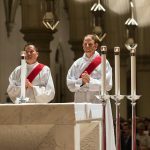 Archbishop Coleridge invited the newly ordained priests and those present to read Pope Francis’ Apostolic Exhortation Evangelii Gaudium (The Joy of the Gospel). 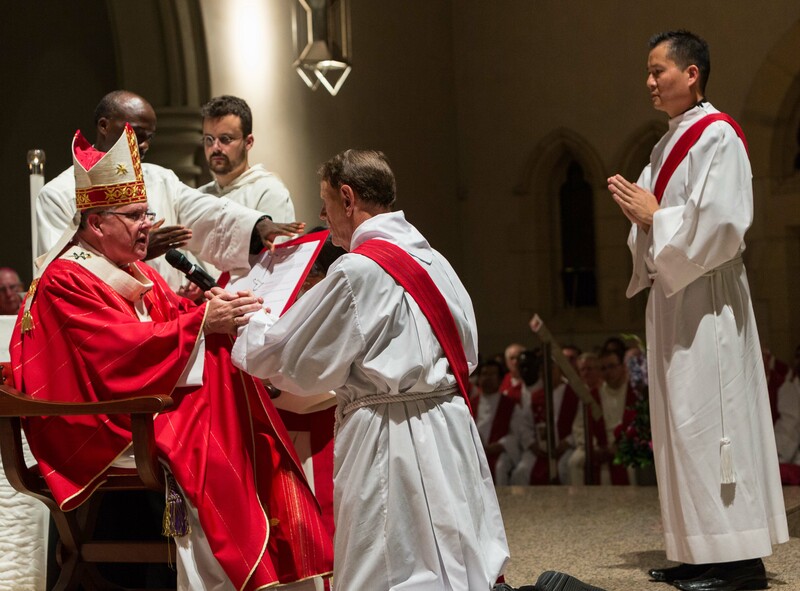 “It’s a cracker – at times even startling and in a particular way I make this invitation to Neville and Stephen on this night of priestly ordination,” he said. 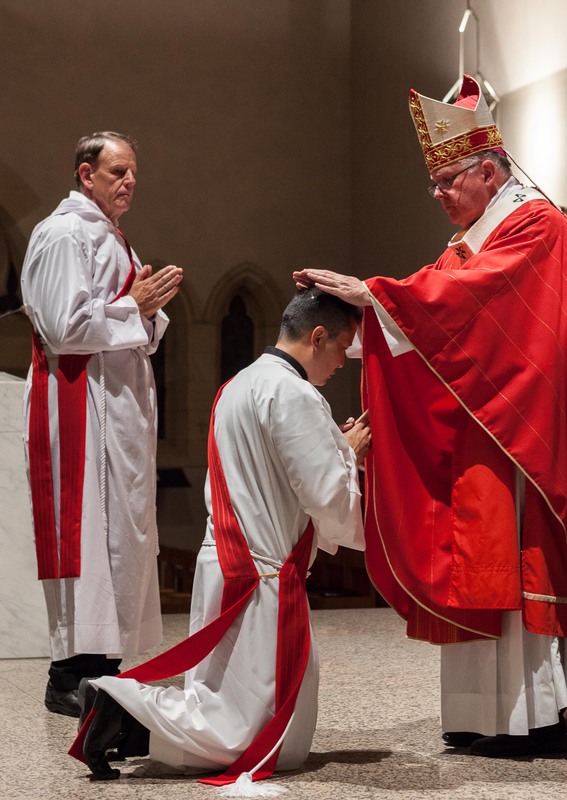 Fr Yun said his ordination was a celebration of God’s love and goodness in his life. 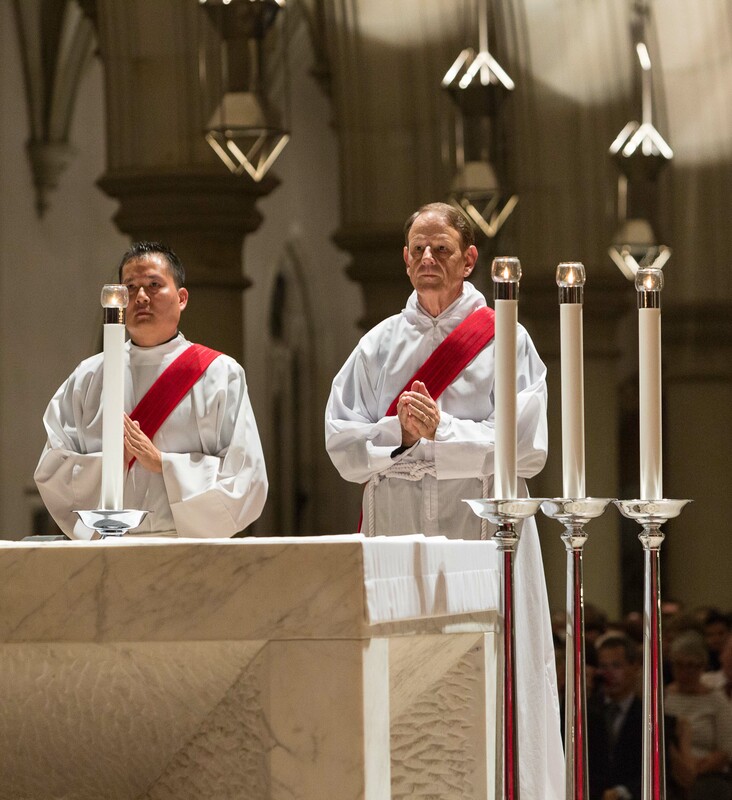 “It’s in one way a sense of peace and joy to finally realise God’s will in my life and to feel the support from everybody who has journeyed with me,” he said. Fr Yun was born in Port Moresby, Papua New Guinea and moved to Brisbane with his family in 1975. 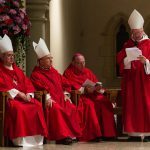 He was educated at Our Lady of Rosary, Kenmore, Nudgee Junior College, Indooroopilly and St Joseph’s College, Gregory Terrace then studied a Bachelor of Information Technology at Griffith University. Fr Yun then spent the next eight years working in the IT industry before swapping technology for social services in 2000. He entered Holy Spirit Seminary at Banyo in 2009 and has since completed a Bachelor of Theology. 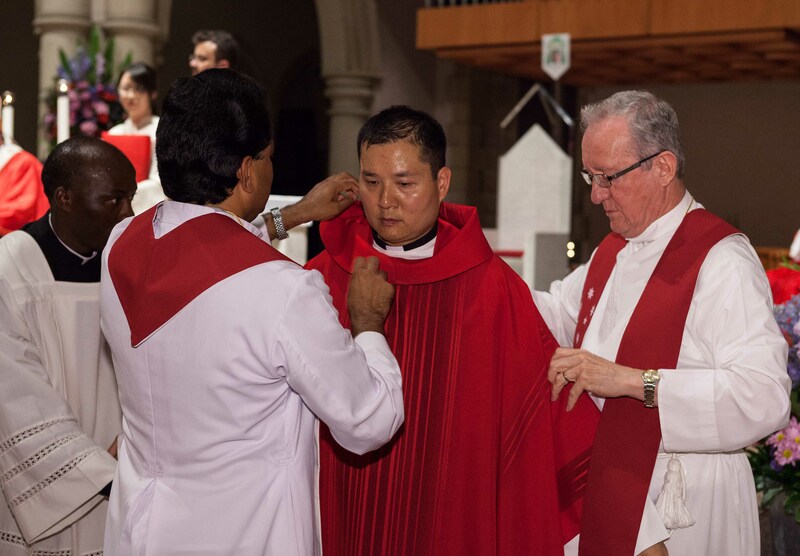 Fr Yun served pastoral placements at Noosa, Upper Coomera, Albany Creek and Redcliffe and spent 2012 in a pastoral internship year at Our Lady of the Southern Cross Parish, Springfield. He is also finishing his Masters in Theology. 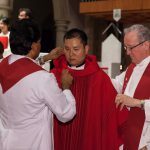 Fr Yun will take up an associate pastor role in the Ipswich parish in January . Fr Gronow was born in Melbourne in 1951. 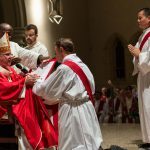 His family was Anglican and Fr Gronow was baptised and later confirmed as an Anglican. He married Joy in 1973 at Saint Peter’s Anglican Church Southport and the couple celebrated their 40th wedding anniversary in March. Fr Gronow was ordained a priest in the Anglican Catholic Church in Australia in 1999. 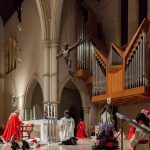 After the establishment of the Personal Ordinariate of Our Lady of The Southern Cross by Pope Benedict, Fr Gronow was received into the Catholic Church and then ordained as deacon in the Chapel of Saint Stephen at Coomera on 23 August 23 by Brisbane auxiliary Bishop Joseph Oudeman. After the ordination to the priesthood Fr Gronow will take up the role of assistant priest at Saint Stephen, parish Coomera. 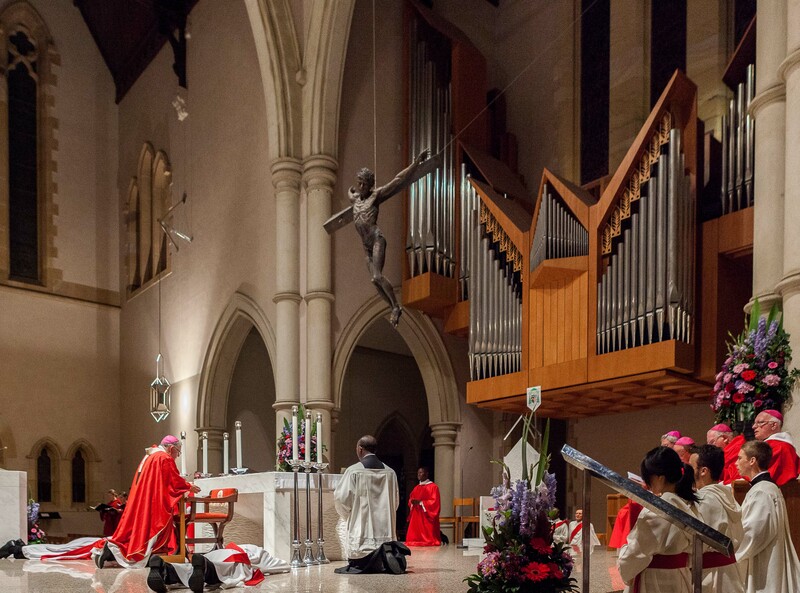 The Personal Ordinariate of Our Lady of the Southern Cross to allow those of the Anglican tradition to enter into the full communion of the Catholic Church while retaining much of their heritage.